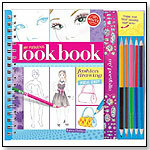 Young fashionistas get to design their own outfits, makeup, hairstyles, and accessories with our 75 pages of lightly printed outlines of faces, figures, and fashionable extras. The grand finale to the fashion show is the Look Book portfolio of keepsake album pages with die-cut frames, perfectly sized to display their best work. Launch date: August 2011.